Created for the Vampire Jam over seven days, Santa Monica By Night is a dark and atmospheric point and click adventure set in the Vampire: The Masquerade universe. You don’t need any prior knowledge of Vampire: The Masquerade to play the game, but if you do then you’ll spot a few references as you explore the seedy streets of LA. In Santa Monica By Night you take on the role of a young thin blood (a half-vampire of sorts), who has been sent to LA by his master to track down a mysterious person called Vincent Lenz. The motives of your master are unclear and the streets of LA are quite unwelcoming, but with a little digging you might manage to find him. 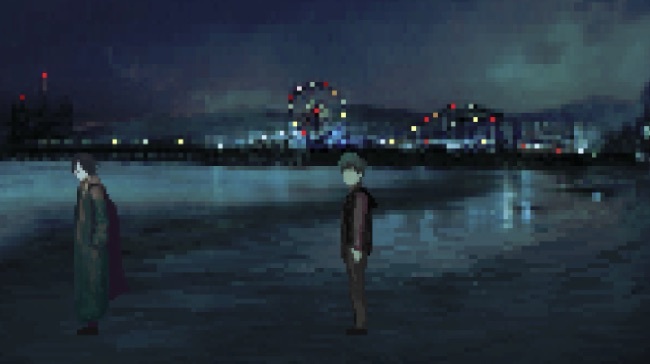 It takes around 20 minutes to play through Santa Monica By Night and there are three possible endings to choose from at the end. It’s a point and click adventure but there aren’t any puzzles – instead it focuses on narrative and world building. The pixel art animation is excellent and it really manages to envelop you in its dark, vampire filled world where trust is hard to come by and death can be around the next corner. A stylish narrative driven vampire adventure well worth taking a bite out of.